How Do Children Affect Tax Refunds? 2. Can I Claim Tuition & Interest Deductions if My Child Claims Themselves? Although you may be up to your elbows in diapers, formula and baby wipes, the IRS extends some financial consolation to you in the form of income tax credits for which your children may make you eligible to receive. But even when your children are far past the baby stage, as long as they’re still your dependents, you’ll continue to reap the tax benefits. When you find out that the results of a 2015 USDA report revealed that a middle-income family will likely spend more than $250,000 to raise a child from birth through age 17, you may want to take advantage of any child tax benefits you can find. 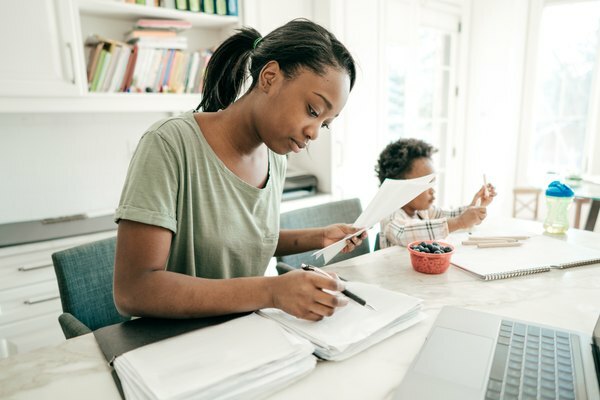 You’ll first have to meet IRS eligibility guidelines for being able to claim your children on your tax return, but once you've checked that off your list, sharpen your pencil and start adding up your benefits. Qualifying dependent children can affect your tax refunds by reducing your tax liability, which lowers the amount of taxes you’ll owe. In some cases, you may even qualify to receive a refundable tax credit. Before you can claim some child-related tax benefits, you’ll have to make sure your child has a valid Social Security number. Even though children are not required to have a Social Security number unless they have a job, receive Social Security benefits or apply for government services, the IRS requires them to have an Social Security number before you’ll be able to claim them as dependents for certain tax benefits. You must have obtained your child’s Social Security number before your tax return filing deadline, which includes filing extensions, or you won’t be eligible to take some tax credits. Visit the Social Security Administration in person at your local field office or online at SSA.gov to apply for your child’s Social Security number. There is no charge for this service, the actual Social Security number or the Social Security card. Relationship test. Through the eyes of the IRS, a child does not necessarily have to be your child by birth to qualify as a dependent child. But the child does have to be related to you in any of these ways: daughter, son, stepdaughter, stepson, sister, brother, half-sister, half-brother, stepsister, stepbrother. A qualifying child can also be a descendant of any of these related children, such as a granddaughter or nephew. Two notable exceptions to the relationship requirement are adopted children, who are always considered your children as long as a legal adoption took place, and foster children. If you’re a foster parent, you can legally claim a foster child as a qualifying dependent if a court order or an authorized agency placed the child with you. Authorized agencies include tax-exempt organizations that are licensed by state or local governments and Indian tribal governments. Age test. Qualifying children must be younger than 19 years old on the last day of the tax year. The IRS makes an exception for full-time students, who must be younger than 24 years old. There is no age limit on children who become permanently disabled any time during the tax year. A qualifying child cannot be older than you (or your spouse, if you file a joint tax return). For example, you may financially support your older brother who lives with you while he's in college. But because he is older than you, you're not allowed to claim him as a dependent. Support test. Qualifying children must not provide more than half their financial support, which includes costs such as food, clothing, shelter, medical costs, transportation expenses and recreation. Residency test. Qualifying children must live with you for more than half of the year. The IRS allows temporary absences for children, including those for students who are away at school. But the school must also meet IRS guidelines as outlined in Publication 501. Allowed schools cover a wide age range for students, including elementary school as well as universities. Schools must have a regular curriculum and a regular faculty. Joint return test. If your dependent child is married, the child cannot file a joint tax return unless the couple files only to claim an income tax refund. Sole dependent test. A child may meet all of the qualifying tests for more than one person, but only one person (or married couple) can legally claim the child as a dependent. If this is the case with your family situation, IRS "tiebreaker rules" (as outlined in Publication 501) determine who can legally claim the child for tax purposes. Once you’ve determined that you are the only person (or you and your spouse as a couple) who can lawfully claim your child or children on your tax return, and all qualifying children have their Social Security numbers, it’s time to begin lowering your tax liability by using available IRS tax credits. The child tax credit was first available to taxpayers in 1998, so it’s not a new kid on the tax block. But in 2018, taxpayers can take up to five times the original $400 credit (and twice the 2017 limit of $1,000 per child) for a maximum credit of $2,000 per qualifying child. Even though taxpayers can claim their children as dependents as long as each child is younger than 19 years old (or younger than 24 for full-time students), the age limit for claiming the child tax credit is 17 years of age. The child tax credit is an income-based tax benefit, which means that the amount of your tax credit depends on your income. Typically, the credit is applied toward the tax you’d otherwise owe, which reduces the amount of taxes you actually have to pay. For example, if you have a qualifying child and your tax liability – the amount of tax you owe – is $6,000, you’ll subtract a $2,000 child tax credit from your $6,000 tax liability, which leaves you owing only $4,000 instead of the full $6,000. But if your income is low enough that you don’t owe any tax, this tax reduction wouldn’t really benefit you. There’s good news, however, in the form of another big perk of the child tax credit. You may qualify for a refund up to $1,400, even if you don’t owe taxes. Compute this by multiplying your earned income that exceeds $2,500 by 15 percent. If you have a qualifying child and your earned income, for example, is $10,000 for the 2018 tax year, multiply $7,500 ($10,000 minus $2,500) by 15 percent. The total of $1,125 is your refundable credit. Your income must be “earned income,” such as wages, salaries and tips, instead of “unearned income,” such as retirement pay, Social Security benefits and dividends, to qualify for the child tax credit. For the 2018 tax year, claim the child tax credit on Schedule 8812 (Child Tax Credit), and attach this schedule to your tax return – IRS Forms 1040 or 1040A (U.S. Individual Income Tax Returns) or 1040NR (U.S. Nonresident Alien Income Tax Return). To claim this particular tax credit, you won't be able to use Form 1040EZ ("the short form"), which is only for taxpayers without dependents. Beginning with the 2019 tax year (for tax returns you'll file in 2020), the IRS is consolidating the Form 1040 series into a new 1040, which will replace the current 1040, 1040A and 1040EZ. Even though the earned income tax credit is not exclusively reserved for taxpayers with dependents, this credit is another example of how children can affect your refund by lowering your tax liability. Like the child tax credit, the earned income tax credit is also income-based and you'll need to have earned income instead of unearned income to qualify. One income exception, however, is an allowable $3,500 on investments. To claim your earned income tax credit, you'll have to file a tax return even if you don't owe any tax and you're not required to file. The IRS establishes the amount of your credit based on your income, filing status and qualifying children (if any). Single, Widowed or Head of Household. When you calculate your earned income and your adjusted gross income, each amount must be less than $40,320 (if claiming one child), $45,802 (if claiming two children) and $49,194 (if claiming three or more children). Married Filing Jointly. If you're married, you'll both have to file a joint return to claim the earned income tax credit benefit. Each of your earned income and adjusted gross income totals must be less than $46,010 (if claiming one child), $51,492 (if claiming two children) and $54,884 (if claiming three or more children). Regardless of your filing status, the IRS places maximum limits on the credits taxpayers can claim. For the 2018 tax year, $3,461 is the cap if you have one child, $5,716 is the most you can claim if you have two children and $6,431 is the maximum credit you can receive if you have three or more children. If your earned income tax credit is more than the tax you owe, the IRS will refund you the difference. But as eager as you may be to receive this tax refund, even if you file your tax return in early January, you'll have to wait until mid-February, which is the earliest that the IRS can release this refundable credit. Another way your children will affect your tax return (in a positive way) is by putting you in the running to take the child and dependent care credit. You're eligible for this benefit if you pay someone to care for your children while you're working or looking for work. Children must be younger than age 13 unless they're disabled, which has no age limit. And if you're married, you must file a joint return to claim this credit. The maximum credit available is $3,000 (for one qualifying child) and $6,000 (for two or more qualifying children). If you're eligible, you can claim the child tax credit and the child and dependent care credit. To determine your eligibility, complete IRS Form (Child and Dependent Care Expenses), which you'll attach to your tax return. Adopted children may also positively impact tax liability by allowing taxpayers to claim many of the expenses associated with adopting a child, or even trying to adopt. The IRS also allows certain income exclusions when an employer provides adoption assistance to an employee. Although this credit is nonrefundable, if your adoption expenses exceed $13,810, which is the maximum credit allowed, the IRS allows you to carry the overage for the next five years. The maximum amount becomes reduced, or phased out, as you approach certain modified adjusted gross income thresholds. For the 2018 tax year, the phaseout threshold is $207,140, with a complete phaseout occurring at an income of $247,140. Complete IRS Form 8839 (Qualified Adoption Expenses) and include this form when you file your tax return. Can the Head of the Household Claim Education Credits?